The information contained on these pages has been made available to all and may be downloaded, copied and distributed for personal use; however, it is not to be used for profit with out written permission. Written permission must be obtained by submitting specific requests to Pauline Pruett . My wish is that you will share it with those who do not have access to the internet. In the Rinehart Newsletter of October 1999 Rick Rinehart challenged someone to find the father of George Rinehart. I asked my husband, Bob Pruett, (better known as my hound dog) if he could do this for us. Within a week he had found the information, and not only did he find the parents of George but a set of grandparents and five sisters. 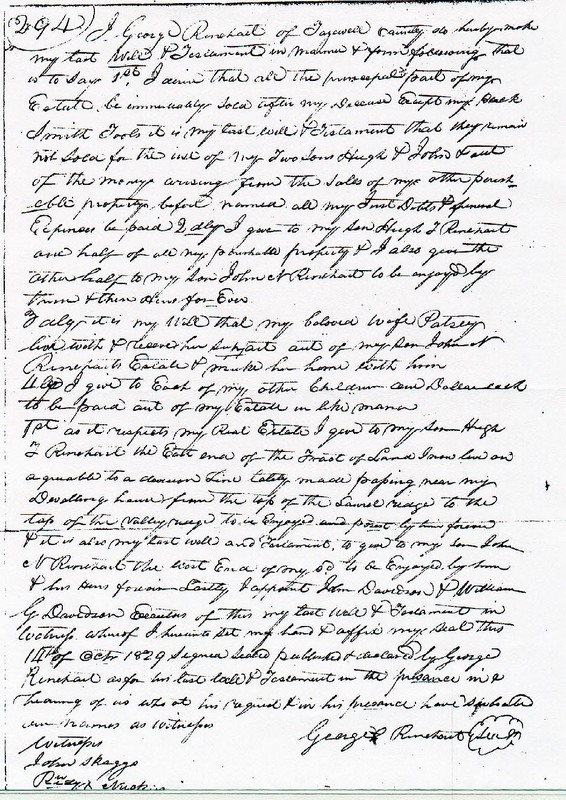 We have a copy of Conrad Henshew’s will from Wythe County Virginia which mentioned his daughter Barbara Rinehart and her son George Rinehart. More on this later. Bob got on the Internet and found the will of Valentine Rinehart of Fredricksburg, Maryland written on June 20 1791, and his wife Barbara Rinehart, son George Rinehart and Frederick Sorries (a son in law) were the executors. George was an only son with five sisters, Elizabeth Sorries, Catrine Shaul, Christenor Snowfer, Mary Weaver (wife of John Weaver - more about her), and Barbara who was married to Daniel Erter. Valentine died sometime before June 1792, for his will was probated on June 8th 1792 and the outstanding bills of Valentine were settled on August 20th 1793. 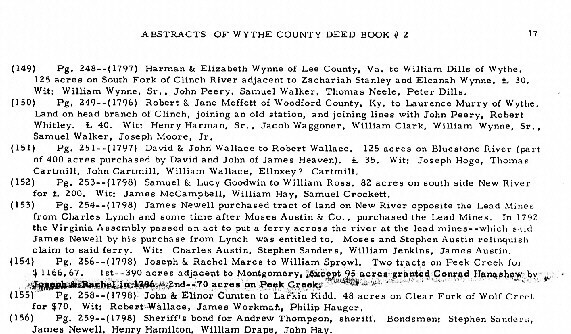 We know that George Rinehart was in Wythe County Virginia in 1795 for he paid taxes in 1796. He was in Fredericksburg, Maryland in August of 1793. We know it took at the very least 60 to 90 days to travel from Fredericksburg, Maryland to Wythe County Virginia. I don’t think they would have traveled after August of 1793 due to encountering bad weather, so this leaves the Spring of 1794 to make the trip. Let’s say George and Barbara left Maryland in April of 1794 they could have been in Wythe County Virginia in June or July of this year. If he bought property in late 1794 or early 1795 he would have paid the taxes in 1796. This leaves approximately six to eight months that we cannot account for the time of Barbara and her son George. But, if we consider they sold all the property left by Valentine, then we know where they were through 1793 1794 and into 1795. Why did Barbara and George move to Wythe County Virginia? We are most fortunate to have the names of Barbara and George Rinehart mentioned in two wills, one of her husband and one of her father. Barbara’s daughters were married and settled with their families, so being a loving and caring son George took his mother Barbara to her parents, Conrad and Catherine Henshew in Wythe County Virginia. 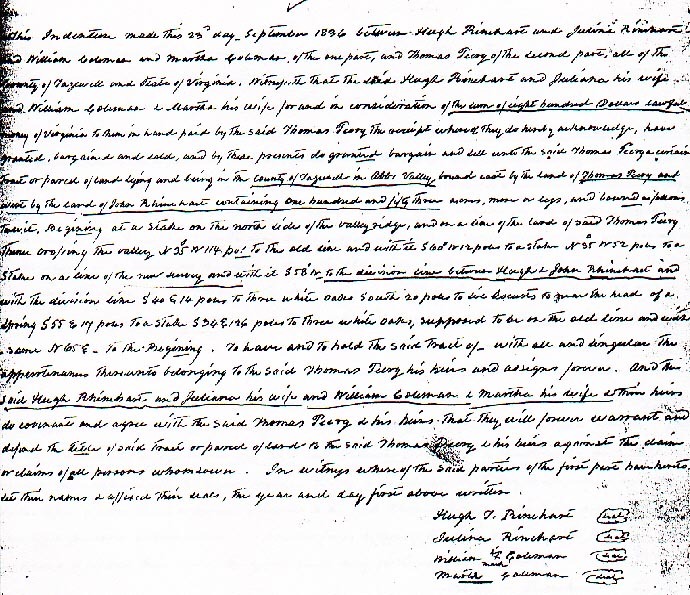 In Conrad Henshew’s will written September 10, 1805 he stipulates that his real and personal estate be sold and the money be equally divided among his children expect for his daughter Barbara Rinehart who is to have an extra five pounds for the benefit of her son George Rinehart. His will was probated in September 1806, so we know he died in that year. One can guess that the reason Barbara was given the extra five pounds was because George would take care of not only his mother, but of his grandmother, Catherine Henshew. George Rinehart’s first wife Hannah died around 1817 and George remarried in June of 1821 to Martha “Patsy” Nuckols, daughter of John and Martha Nuckols of Tazewell County Virginia. Their son John G. W. Rinehart would have been born in March/May of 1822. 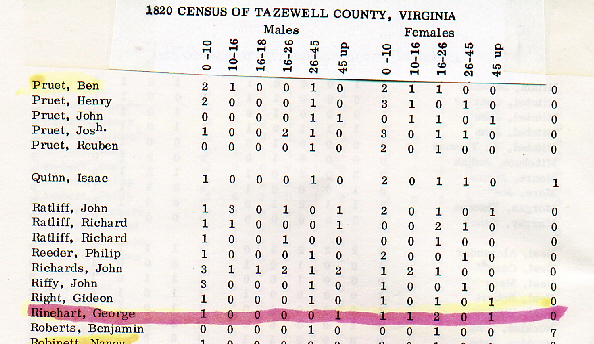 In the 1820 Tazewell Co. Census, there is a lady 45 and over living in the home of George Rinehart - this would have been his mother Barbara who was taking care of his small children after Hannah died. It would seem that George married Patsy Nuckols after the death of his mother. We know that George was not born after 1770 so this would have made him 50 to 55 years of age in 1821 and Patsy was twenty years old at the time of their marriage. 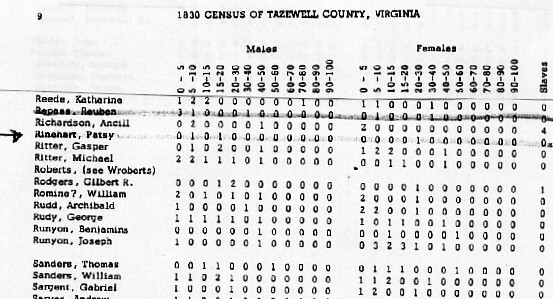 In the 1830 Tazewell County Va Census we find Patsy head of house (George died in 1830) and living with her is a male (0-10) John G.W. would have been eight years old at this time and a male (10-20) would have been Hugh Tiffany Rinehart (son of George and Hannah Rinehart) who would have been around seventeen years old at this time. In George Rinehart’s will he left half his property to his son Hugh T. and the other have to his son John N. (this initial was probably intended to be a W). George stipulated in his will that his beloved wife Patsy was to live with John and to receive her support out of his share of his estate. If Hugh T. and John were the son’s of George and Hannah ( his first wife) then it would seem that he would have wanted Patsy to live with his oldest son, Hugh T. instead of the younger John. In September of 1836 the land left to Hugh T. and John was sold to Mr. Perry for the sum of $800. This bill of sale was signed by Hugh T. and Juliana Rinehart and Martha (John G. W.’s mother and second wife of George Rinehart) and William Coleman, her second husband. Hugh T. would have been twenty-three at this time while his half brother John G.W. would have only been fourteen years old, and unable to legally sign for his share to be sold; therefore, his mother and step-father signatures were required in his place. 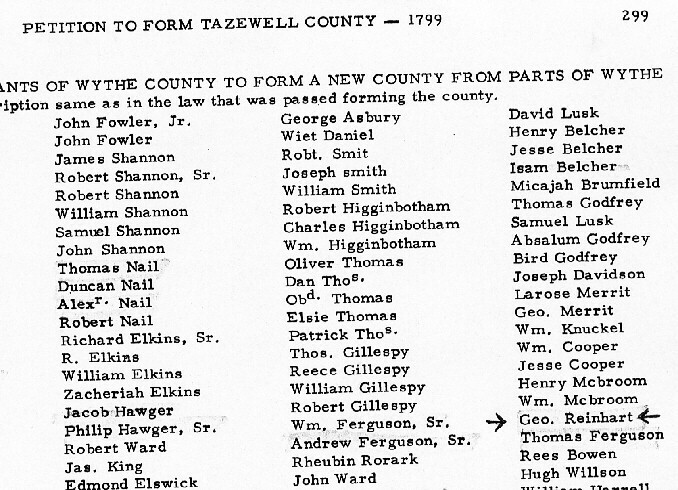 Tazewell County Virginia was formed out of Wythe and Russell counties in 1800. 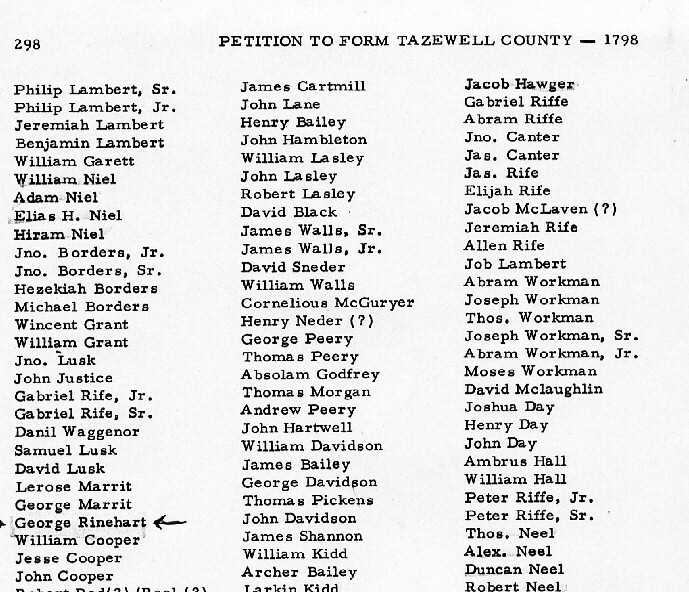 George Rinehart signed the petition to form Tazewell county in both 1798 and 1799. Some of the people who previously lived in Wythe and Russell county now lived in Tazewell county Virginia, including George Rinehart. Rick Rinehart sent us a topo map of land in Tazewell county, and from this Bob found the land owned by George Rinehart. I called the lady who now owns this land and she told me of a cemetery and an old log house on the property. Bob and I visited both and feel that the log house was built by George Rinehart and that the cemetery was started by him. There is no way to prove this, but we are 99% sure. 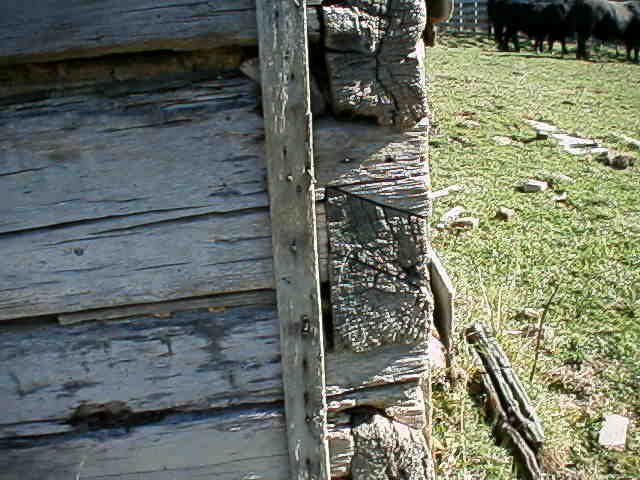 No one has lived in the log house for years and it has fallen into disrepair. 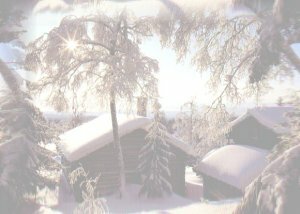 It was a two story house and some of the logs are a foot or more wide, dove tailed and hand hewn. It is truly beautiful to look at and to think that they were possibly made by George Rinehart can send chills down ones back. The cemetery has no name, and is within walking distance of the log house, which was a practice during this time. It has seven graves marked with field stones. Four adults and three children. 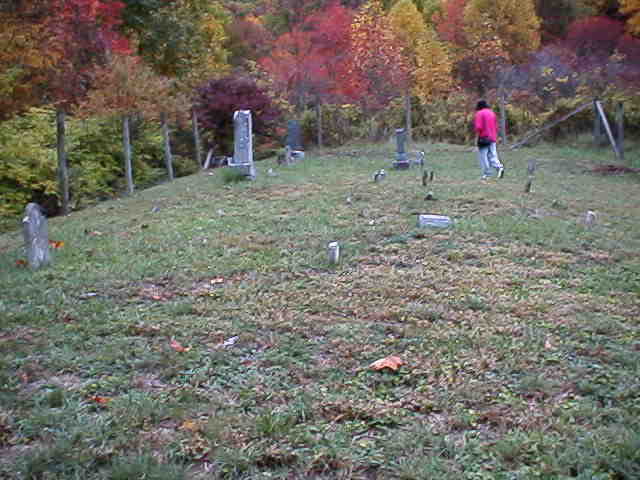 Much later, Moors and French’s were buried in this cemetery and have markers. The four adult graves could have and probably were the graves of Catherine Henshew, (grandmother of George) Barbara Henshew Rinehart (mother of George), Hannah Sebert (first wife of George), and George Rinehart himself. The three children graves could possibly be the three children of George and Hannah Rinehart who cannot be accounted for. Possibly is a very large word, but when working in genealogy and one finds gray areas, possibly is the only word we can use. I know of no way to prove the authenticity of ownership of the log house and cemetery, but those of us who are familiar with the area and the way the people thought at this time, can be fairly certain this is the home of George Rinehart. Direct comments to Pauline Preuett. updated on a regular basis, is owned and managed by Pauline Pruett. Problems about this website may be address to webmaster lsakers@citlink.net. Please reference the website title in your e-mail.